Despite the fact that there has been a huge campaign to inform women about the different ways that heart attack can present, we (women) are still waiting too long to call for help. I believe that one of the reasons has to do with our nature. Most of us live in the land of denial. We do not think that something like heart attack can happen to us. In addition we are so busy taking care of others that we often ignore our own symptoms. Research looking at heart disease in women done by the National Institutes of Health found that 95% of women studied noted symptoms that were unusual for them one month prior to having their heart attack. The most common being unusual fatigue; sleep problems, shortness of breath, indigestion and anxiety. Despite all the research and push for public awareness, heart disease is still the number one cause of death in men AND women. Risk factors include: family history of heart disease, high blood pressure, high cholesterol, obesity, diabetes, lack of exercise, smoking, stress, and low magnesium. Regardless of whether you have any of these risk factors or not, if you are a woman and you experience overwhelming fatigue like you do with a bad flu, (but you don’t have the flu), trouble sleeping, anxiety, a sense of dread, shortness of breath, vague chest or jaw discomfort; you may be having a heart attack or you are about to experience one. If that is the case, do NOT drive yourself to the emergency room. Do NOT wait till a friend or family member can take you to the emergency room. Do NOT ignore the symptoms. Do call 911 and chew an aspirin while you wait (provided you are not allergic to aspirin). The reason you call 911 is that you want to be cared for as soon as possible. As most cardiologists will tell you, time is muscle. If you take yourself to the emergency room, you may have to wait and that might have tragic consequences. I had a patient many years ago, who had her heart attack while she waited three hours in the waiting room of a hospital emergency room. Do not let that happen to you. The longer you wait the greater the chance you will sustain long-lasting heart damage. The sooner they can help you the better your chances of a full recovery. Most of us may be self-sacrificing but we have really good gut instincts. Listen to your intuition. If you think that something is wrong with your heart then you are probably right. Take care of your heart so it can take care of you and keep you vital and healthy. I recently went on the trip of a lifetime. 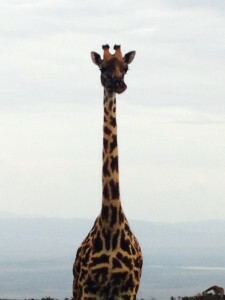 I was able to go to Tanzania for a safari experience that was spectacular. Before I went on the trip, I researched what vaccines I needed and what medication to take in case of illness. According to the Centers for Disease Control (CDC), the one thing I really had to be aware of was the chance of getting travellers diarrhea, which is pretty high (where I was going) at somewhere between 40 to 70%. I could just see myself on the jeep amidst all the wild animals (that included elephants, giraffes, wildebeests, and very hungry lions to name a few) trying to figure out where to go to the bathroom if diarrhea struck at the wrong moment. That would definitely have put a damper on things…to say the least. Fortunately, a friend of mine who is an emergency room doctor had gone on a similar trip. She gave me the key to preventing a diarrheal illness. It came in the form of a pretty pink tablet that tastes like mint. The remedy is something that has been around since 1901. It is good old Pepto-Bismol. She suggested that I take two tablets prior to each meal. The CDC recommends 2 tablets four times a day. I was religious about taking my Pepto and I remained healthy while many people around me were dropping like flies. The way it works is by coating the stomach and intestines protecting them from acid and killing potentially diarrhea-causing bacteria. Pepto-Bismol is a relatively safe treatment. However, it contains salicylate, which is found in aspirin. People who have aspirin allergies or who are allergic to nonsteroidal anti-inflammatories should not take it. In addition, it contains bismuth, which can turn your tongue and stool black and can cause constipation. Fortunately, I had no problems with my newfound preventive treatment. From now on when I travel outside the country I will make sure I have a good supply. It is cheap, effective and it really did work like a charm. It kept me safely in the jeep and out of harms way. Asante sana (that is Swahili for thank you very much) Pepto-Bismol!